the pain of letting go, it is time to let go. Boy was she right. And now, every time I catch myself entering a bout of stress-induced irritability, I take a deep breath and do my best to let it GO. Today, I encourage you to do the same. Let go of feeling like you aren’t making progress fast enough. – No matter how many mistakes you make or how slow you progress, you are still way ahead of everyone who isn’t trying. Let go of the idea that you have too much to lose. – In the end, you won’t regret the things you’ve done nearly as much as the things you didn’t do when you had the chance. I’d rather have a life of “OH WELLS” than a life of “WHAT IFS.” Wouldn’t you agree? Let go of all your empty complaints. – If you don’t like something, change it. If you can’t change it, change the way you think about it. Let go of making the same mistakes over and over. – You can’t make the same mistake twice. The second time you make it, it’s no longer a mistake, it’s a choice. Let go of thinking you should always get what you want. – Not getting what you want is sometimes a wonderful stroke of luck. Let go of the notion that life is fair. – If you expect the world to be fair with you because you are fair, you’re fooling yourself. That’s like expecting the lion not to eat you because you didn’t eat him. Let go of thinking others have it better than you. – Truthfully, nobody has it easy; everybody has issues. If everybody threw their problems in a pile for you to see, you would likely grab yours back in a heartbeat. Let go of the expectations that are holding you back. – The quality of your life is always 10% of what happens to you and 90% of how you respond to it. Let go of the need to always feel comfortable. – If you want to make an impact, big or small, get comfortable with being uncomfortable. All growth begins at the end of your comfort zone. Let go of thinking you have to know everything first. – You don’t have to have it all figured out to move forward. Just do the best you can until you know better. Once you know better, do better. Let go of the “all or nothing” mentality regarding success. – Appreciate the grey area between the extremes of success and failure – the journey, the experiences, etc. And above all, never let success get to your head or failure get to your heart. Let go of your mistakes. – Don’t carry your mistakes around with you. Instead, place them under your feet and use them as stepping stones. Let go of wanting stuff you don’t need. – Don’t think of cost. Think of value. And remember, it’s always easier to find wealth by needing less, instead of making more. Let go of your ungrateful thoughts. – Happiness never comes to those who don’t appreciate what they have. So be thankful today. Life isn’t perfect, it’s just pretty darn good. Let go of any hypocrisy. – For instance, don’t pray when it rains if you don’t pray when the sun shines. Let go of assuming other people are more “normal” than you. – The only normal people you know are the ones you don’t know very well. Period. Let go of the emotions that often get the best of you. – Stay strong. Even when it feels like things are falling apart, they’re not. Take control of your emotions before they take control of you. Let go of your temper. – Never do something permanently foolish just because you are temporarily upset. Let go of ugly words. – Saying someone is ugly doesn’t make you any prettier. Let go of trying to change others. – For the most part, you can’t change people and you shouldn’t try. Either you accept who they are or you choose to live without them. Let go of thinking you’re too cool to be kind. – It takes a great deal of strength to be gentle and kind. And you are much stronger than you think. Let go of being “too busy” to SHOW your love. – Loyalty is hard to find. Trust is easy to lose. Actions speak louder than words. Tell your loved ones you love them every day, and prove it. Let go of one-sided relationships. – If someone truly cares about you, they won’t make you feel like you need to constantly fight for their attention. Let go of those who have never been there for you. – Remember, it’s during the toughest times of your life that you’ll get to see the true colors of the people who say they care about you. Let go of all self-hate. – Love yourself! Forgive yourself! Accept yourself! Let go of any lies you’ve heard that you aren’t attractive enough. – More women worldwide are suffering from anorexia and bulimia than are fighting breast cancer. Love yourself the way you are. You are already beautiful. Let go of trying to be someone else. – Someone will always be prettier. Someone will always be smarter. Someone will always be younger. But they will never be YOU. And that makes you powerful. Let go of the things people say about you. – Try not to take things other people say about you too personally. What they think and say is a reflection of them, not you. Let go of the petty arguments. – You can’t change how people treat you or what they say about you. All you can do is change how you react and who you choose to be around. Let go of needing everyone to like you. – Everyone doesn’t need to like you. But remember, just because some people don’t seem to care for you, doesn’t mean you should forget about everyone else who does. Let go of changing just to impress people. – Don’t ever change just to impress someone else. Change because it makes you a better person and leads you to a brighter future. Let go of life’s little annoyances. – Don’t let dumb little things break your happiness. True wealth is the ability to experience and appreciate each moment for what it’s worth. Let go of thinking that giving up means failure. – Giving up and moving on are two very different things. Sometimes the hardest part isn’t letting go, but rather learning to start over in certain areas of your life. This is a challenge all of us face. If you’re struggling with any of the points above, there is a clear path to the new beginning you seek. Your present habits are simply broken and need to be mended. When you trust a broken set of habits every day, it’s only a matter of time before you feel broken too. It doesn’t have to be this way though. You can make adjustments starting today that will instantly help you feel better, think more clearly, and live more effectively. That’s why we wrote our book, “1,000 Little Things Happy, Successful People Do Differently.” It’s filled with short, concise tips on how to do just that. Check it out. What’s the #1 thing you need to let go of before your next birthday? Leave a comment below and share your thoughts with us. I still need to learn how to let go of my mistakes. Even when I’m perfectly aware of what I’m doing, I somehow keep holding on and obsessing over them… usually until I manage to snap out of it with the help of positive outside influences. I still need to learn how to let go of my mistake. I still need to learn how to let go of my baggage. Gossiping has been a real drain on the psyche, and it’s something I’m currently working on letting go from my life. As soon as I started making an effort to stop gossiping about other people, I started feeling more confident about myself too. Suddenly I didn’t care as much what other people thought about me. It was like magic how this happened. Letting go of the wrong habits creates room for the right ones. No doubt about it! Great read. For me, letting go is all about getting involved in something positive. Instead of constantly reviewing the past, I do something enjoyable and worthwhile with my present. Love the articles you post. You always leave me with something to think about – with inspiration swelling within. I’ve realized that I need to let go of one-sided relationships and being too hard on myself. Sometimes acknowledging our faults really hurts but it’s a part of being human and your blog has really helped me to accept this and awaken the “better” me. I’m learning to let go of negative experiences and people and focus on letting my positive spirit radiate wherever I go, no matter the circumstances. It’s a tough challenge but I’m up for it because we all have the ability to grow. Thanks for the inspiration!!! 26. What would you suggest when you know how lucky you are and really have no right not to be happy, but you feel unhappy more than average none the less? 38. What if it’s negativity that’s hard to avoid? The biggest downer in my life is my brother. Since we still live both in the same house, so there’s no avoiding him. I love him, but he has spent the last 10 years or so telling me I’m ugly, that I have no friends, that he is ashamed of me and just insulting me in general. Daily. I don’t think he really means it. I think he’s just trying to feel better about himself somehow, but it jury’s none the less. How do you escape such negativity? 40. I would add men to this point too. You’ be surprised how much men have to fight it too. That’s a pretty big list. Lots to do. I needed this today so bad. I met a wonderful young woman who I fell madly in love with . She said she loved me, but like in your sayings, didn’t back it up and didn’t initiate very much. She lives half a world away, which already makes communication and visits tough. I miss and want to have a life with someone I connect with so bad! It’s so hard to let this feeling go. Taking it one day at a time. I want to learn how to let go of the negative things that happened in my past. I want to learn how to use them as a stepping stones into the future. I have a lot of work to do! Thanks for the great post. I need to let go of attachment because I have a tendency to get too wrapped up within situations and projects, e.g., volunteering and children’s picture book series, that I stifle the energy and creativity. I also need to let go of having to finish what I start. Sometimes, the best decision is to walk away. Finally, I need to let go of perfection, which is entwined with failure. I’m not perfect, who is? If I don’t finish what I started, this doesn’t mean I’m a failure. It just means that I was passionate enough about a project. I look forward to your posts every time I see one come to my inbox. They really help me out. I feel almost lost sometimes if I don’t get a chance to read them. Thank you for making the world a better place. What profound thoughts today. I needed to read this, and like Dev, I want to re-read it each day, week until my birthday and focus on one thing I can do better. Some of the comments with quotes from your book have also hit the spot. Looks like I need to pick it up. Thank you for sharing words of wisdom. My birthday is Feb 28 and I am going to California specifically to let go of the past and create the future I dream of. GREAT post… so many tweetables. AMAZING! Just what I needed and quite possibly, (if it is possible since all your posts are fabulous) the BEST post ever! Thank you for your wonderful work. Thank you for sharing this. As a recovering addict there is a lot in my life to let go. Your list helps me to focus on the benefits of letting those things go and how doing so will help me to overcome the thoughts and actions that perpetuate my addiction. Very helpful. This was the absolute perfect thing for me to wake up to this morning because TODAY is my birthday! I’ve been slowly making progress with a lot of the items on this list, and even though these truths are simple and obvious, I still find myself doing things that are holding me back, despite knowing that I can choose to do anything at any point in time to change the situation. I enjoy your advice and this is so relevant to my life as I’m turning 50 in September. I’m ready for the second half of my life and know my best life is yet to be lived. Thank you so much for your wisdom, advice and inspiration! This is my life’s to do list! I have a huge milestone birthday coming up in 7 months and it has been weighing a bit heavy on my heart/soul. Albeit much better to be celebrating a large number than not, it has also made me reflect on so many PAST memories that have been consuming me…so #12 is perfect for me to reflect on in that there is still much of life to seize and that the present & future is indeed a time to look forward to. Thank you so very much for this post today. This is the one I made the decision over the weekend to address. So many missed opportunities have occurred in my life because I (or someone I was counting on) held back waiting for the ‘perfect moment.’ I finally realized over the weekend that the perfect moment doesn’t exist, but losing momentum and breaking your spirit, inspiration and passion for it sitting in stagnation while you’re waiting for the perfect time can cause lasting irreparable damage. So I’m taking action today and trying yet again, and hopefully this time things will fall into place and move forward finally, that this approach is the right one to get things in motion. Another very timely post. Thank you! Super 50 reasons before a milestone b’day this year! I always look forward to your emails and thank you very much. Wish you both continued success. I love this post. Simple reminders I desperately need. I’m currently working on letting go of a recent failure that had my mind in the gutter. Because my birthday is only in November, I have time to address all I need to … I took them down. But in the near-term, I need to work on 17 and 36. I have something like less than 3 months to figure it out… thanks for this lovely post! Thanks for this post Marc and Angel!! Honestly you guys have amazing timing with your posts. I just had yet another argument with my mother who is constantly bringing out the worst in me and making assumptions as she somehow feels it helps me ‘grow’, granted she did have a tough life but she unknowingly repeats these devastatingly sad stories to me and compares my minor mistakes (common human, everyday errors – no one is perfect!) to her past life and lectures me. I know in her mind she feels this is helping me but honestly it makes me feel worthless… I mean if I had to bring out every bad thing one person did they would seem like a terror. I don’t have the courage or the heart to tell her how I feel as she will bring up some bad mistakes I made in the past and then things just get really bad. But I guess one thing I need to change before my birthday is learning to accept who I am and appreciate myself and not let the negativity dictate my life. “Just do the best you can until you know better. Once you know better do better” those words are just what I need at the moment. Thank you. I need to let go of waiting for perfection. I like your idea of “endless playful exploration.” We truly begin to experience freedom when we let go of our illusions. My birthday is tomorrow, and this is like an early present. Thanks! 1. Tell someone how much I love and miss them. 2. Do something absolutely wonderful for my best friend. 3. Move on with my life. Overall, I NEED to quit living in the past. I NEED to forgive myself. I NEED to realize that my life has substantial value. Finally, I NEED to stop making excuses for those that have caused me harm. You guys are nothing short of a blessing! So to start, I want to thank everyone here, the authors of course, but also all the people who share their stories. This is so valuable to me. The “let go” I want to focus on this year is time travel… i.e. to stop living in the past and future… so i can live fully every moments of my life. This post is such perfect for me today. After reading some of the comments I felt better… knowing that I’m not the only soul struggling in this complex world. Does it make sense that knowing that everyone else has their own issues makes me feel better about myself ? I have been trying so hard to fit in with others? I have lost myself so many times in the journey, but I have no problem to start all over again. In the past, the most painful experiences have been when people say they don’t understand me. I live in a Scandinavian country where everything is new and overwhelming for me. But from now I will not try so hard to fit in other people’s understanding… I will try to understand that anyone is perfect just the ay they are, even the ones whom superficially judge me. Letting go the hate and stress will free me. Thanks for the post and comments everyone. Thank you so much for the great message. Letting go and forgiveness it has been my problem, but now I understand life is too short and I need to be myself. Fighting will not take me anywhere. Am starting a new life today. So many of these things I have been working on for quite sometime now. Thank you for reminding me that I need to set a deadline for these to be finally accomplished. I really understand how overwhelming it is to be somewhere new. Maybe you’re trying to work, go to school, raise a family, or a combination of everything. It’s tough when you’re away from familiar places and faces. The stress can be unbearable for sure. What helps me get through is always remembering that the uncomfortable pain I’m feeling is progress. It sounds like you are moving forward, trying to reach a goal you’ve undoubtedly set for yourself. Hang in there, continue to be yourself, and slowly but surely things will fall into place. #29 was really a helpful reminder to me. An emotion I was unaware of was pulling me back and now I’m aware. Thanks. Great post…you covered a lot there. The one I was looking for but didn’t see was letting go of the need to control. This one gets me into all sorts of trouble and stems from my childhood. It took some great meditation sessions and EFT work to try and get a handle on this and I continue to work on it to this day. I have to let go of thinking I have all the time in the world, before it turns into a full blown case of “fat cat” syndrome…. great list! I like the birthday deadline idea. No. 39 is something I am struggling with and it is already a decade since I started hating myself. It makes me very unhappy and it reached the point pf depression. However, I realized that I am never going anywhere with the self-depreciation. And also, it is somehow the root of most of my problems regarding my professional life. So, starting this year, I am going to accept myself as who I am, little by little. 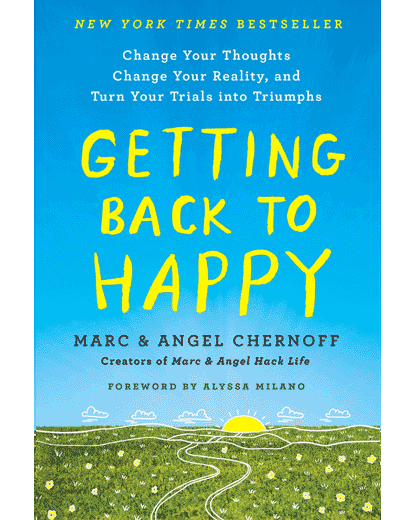 Thank you, Marc and Angel, for the very valuable advice and lessons you are imparting to those who need it. It is like a beacon, shining as a source of warmth to the weary, uninspired and hurting. It may feel like it’s too late to start over. But it’s never too late to plan a better end. Absolutely love this list! I’ve just had my birthday, so I have some more time left to work through it. 😉 I especially love #18. Without facing what makes us feel uncomfortable there’s no growth, and also no chance to make life-altering experiences. @Everyone: Thank you so much for sharing your thoughts on letting go. I especially enjoyed reading the new additions to the list (I took notes). Truly, the hardest part about growing is letting go of what you were used to, and moving on with something you’re not. But it sounds like so many of you are moving positively forward. @Angy: You got it. The first step is to let go of the all hateful/resentful thoughts. You can’t possibly more forward without doing so. Best of luck to you. Letting go of the need to feel comfortable. My comfort zone has been my downfall. I have 2 months to work on it. This article allowed me to reflect not on what I would let go, but what I would keep in my life. I immediately felt overwhelmed by the good that surrounds me. And I felt compelled to reach out to every true friend and express how much they mean to me, how deeply I appreciate their presence on my worst and best days. Thank you for helping me start my day with positivity and gratitude. Thank you for this post. There were so many things in it that I identified with that I lost count. My birthday is in two weeks. I definitely plan on working on a few of these items and then progress from there. Thank you again!! I’ve just come across this website and can’t stop reading all the wonderful and inspirational articles and posts. I’ve just hugged my mom while she sits and watches tv, while I sit in a corner wiping away my tears as I realize how much I need to work on. I’m looking forward to a brighter future. Today, of all days, I needed this list. These are things I knew to do. But it had to be clearly spelt out in black n white for me to really see how much I can achieve if I actually did these things. Thank you so much. I will rid myself of all my bad habits. I will let go of anger and frustration so I’m not moody and explode on my loved ones. I will practice what I preach when it comes to focusing on what I need to do to live a happier life. I will take all the ideas in my head out and do something new. Also, I will rid myself of all my unhealthy choices. I know what I should be doing and have not. I promise myself that I will make these changes. They may be baby steps, but they are steps forward to a better me! I love you all and I love myself. PEACE AND LOVE TO ALL COMMENTING ON HERE!! I really love and appreciate this work of yours. It’s some of the best inspiration I have ever read online. Please keep it up! My birthday is in a few hours so I don’t think I’ll cover the 50 points but I’m starting with 9 and 12. And I should say number 37 was a big eye-opener. And it’s my birthday tomorrow. I see some points that I had already covered. And I’m focus hard on #26 and #50. My bady’s dad & my fears.